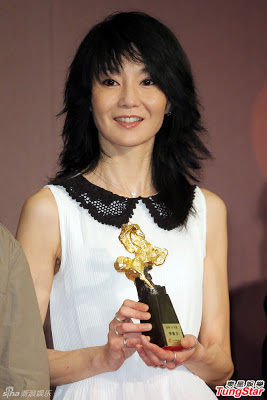 Maggie Cheung Man-Yuk and the Golden Horse Awards. Maggie Cheung has been named the Ambassador for the 50th anniversary of the Golden Horse Awards (actually it is called "The Golden Horse Film Festival"--the Taiwanese film competition has a festival like jury that names the winners) and since she has a very crowded mantlepiece with five of the equine honors it seems like a safe choice. She was called to the podium to receive the Best Actress accolade for Full Moon in New York, Centre Stage, Comrades: Almost a Love Story and In the Mood for Love, and picking up a Best Supporting Actress award for Red Dust. Zhang Ziyi showed effortless star power facing the cameras as the jury for the Un Certain Regard competition lined up for photos. It is a big deal, at least in France--the prix un certain regard was introduced in 1998 to "recognize young talent and to encourage innovative and daring works by presenting one of the films with a grant to aid its distribution in France." Her jury mates included Danish director Thomas Vinterberg and French star Ludivine Sagnier. Zhang Ziyi and Agnes Varda flank Singaporean director Anthony Chen after presenting him with the Camera d'Or for the best debut feature at the festival for Ilo Ilo. 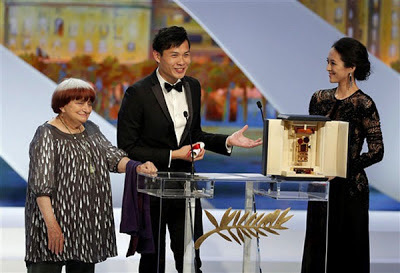 It was the first ever award of any type for a Singaporean film at Cannes; Chen said that he felt "unreal" and this "his head was a little light." The Camera d’Or (Golden Camera) is given to the best first film in one of the official categories of competition: Official Selection, the Critics’ Week and the Directors’ Fortnight. Zhang looked lovely in a sheer black embellished gown by Elie Saab who remains he go to designer for Chinese actresses at mega-events. Ilo Ilo is the story of a family of three in Singapore and their newly arrived Filipino maid. One would expect it might touch on subjects like race, class and gender although one might well be wrong. Like Zhang YuQi at the opening ceremonies, Fan Bingbing went ultra glam with a satin creation by Russian designer Ulyana Sergeenko, complemented by diamond accessories and a simple, dramatic hairstyle. This is why designers from all over the world compete to have her wear their dresses at big events and particularly at Cannes, where she has caused jaws to drop for the past 14 years. The Hollywood Reporter and luxury shoe merchant Jimmy Choo presented FBB with THR's first annual International Artist of the Year award, an engraved Lucite paperweight. No word on the criteria for the award or whether there will be a second annual presentation next year. It's May and it is raining on the sun-kissed Mediterranean shore of the land of liberté, égalité and fraternité which means Fan Bingbing is ruling the red carpet of the Cannes Film Festival. FBB has become such a fixture at Cannes that it would be real news if she skipped a year. To the relief of fashionistas, reporters for the rag trade papers and hungry photographers she was once again the Queen of Cannes. The big event was the premier of Baz Luhrmann's "The Great Gatsby"--early reviews indicate that Gatsby remains an unfilmable story but something had to kick things off so it might as well be a 3-D version of a work that refuses to live beyond the printed page. Zhang Ziyi, a member of the jury for the prix un certain regard was cool in Dior while Zhang Yuqi was either a perfect representation of old Hollywood glamor or a wardrobe malfunction waiting to happen. Zhang Ziyi stopped by the premier on her way to a jury meeting helping decide which young and not well known director's career will get a huge boost and a pile of cash for distribution for winning un certain regard. If you ever wondered "who wears a trouser suit at one of the biggest fashion events of the year?" there is now an answer--the Divine Miss ZZ does, although her outfit came straight from the Dior couture atelier. Her spiky wig seemed like an accessory to her outfit--it isn't a very good look for her, reminding one (at least this one) of aging divas like Sharon Stone. The diamond jewelry and ruby clutch, her dramatic upswept hair style along with matte, pouty makeup and, most obviously, the daring decolletage of Zhang Yuqi's dress by Russian designer Ulyana Sergeenko (more on her later) combine to stay just this side of tacky. Another carat of bling or an extra millimeter of fabric from the neckline would have pushed her onto a few worst dressed lists. She makes it all work, though.